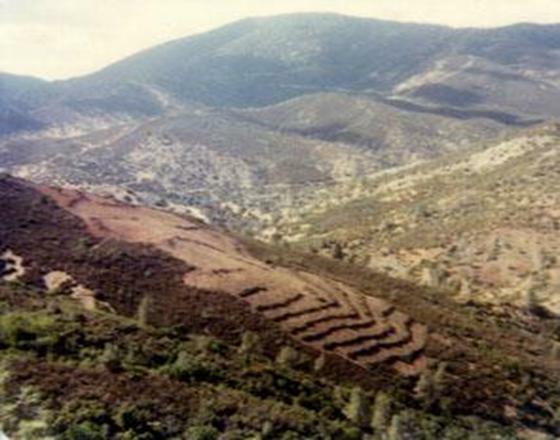 LOVELADY RIDGE — The 1976 Mendocino Hotshot wildfire hand crew constructed the 8.5 windrows in about 8.5 hours. The cut brush was burned when the danger of severe fire spread was minimal. This clearing was then planted in grass to decrease the intensity of reoccurring wildfires. Trees compete with each other for water. A tree's natural defense mechanism against bark beetle attack is reduced when it becomes stressed. If trees lose the battle for water with neighboring trees and become stressed, they are most susceptible to beetle attack. 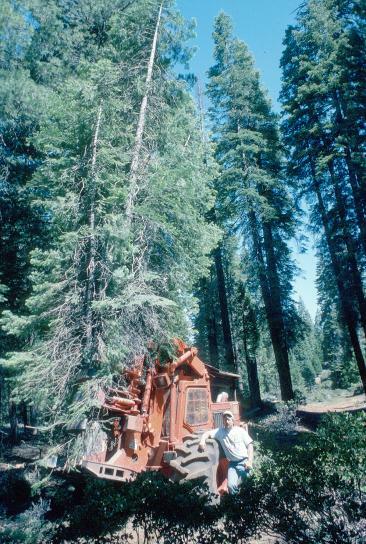 During the late 1970s, a drought severely affected the forests of Northern California. The US Forest Service budget did not allow for the intensive investment in environmental preparation and salvage contract administration that was necessary to harvest the increased mortality from bark beetle attack to prevent massive kill in the National Forests. Threat of a law suit by neighboring tree farms (the only thing that seems to get the attention of bureaucrats) led to Congress increasing the budget. 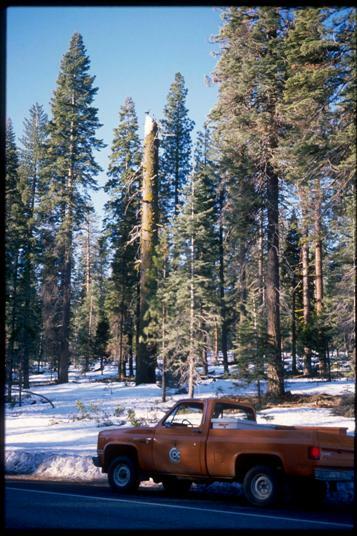 That was when I moved to Plumas County to take a temporary job as a forester on the Plumas National Forest. Wet behind the ears, as many of us were, we aggressively sought dead and dying trees and directed their removal. Stumpage paid to the US Forest Service for logs removed actually returned more money to the treasury than its original investment in environmental reports and temporary staff increases. It was a prosperous time. The healthy trees were given more space to grow, while the dead and dying trees contributed to the economy. The massive tree death that took place in the San Bernardino Mountains was not only on government land, but also on small private parcels. The massive tree death that took place in the San Bernardino Mountains was not only on government land, but also on small privately-owned parcels. Dead and dying pine trees were not removed in a timely manner and the result was the death of almost every pine tree. The summer of 2012 saw large fires near Fort Collins and Colorado Springs. Much of it was fed by bark beetle killed trees that could have been harvested and turned into sawlogs or chips. Timber management in the San Bernardino Mountains hasn't taken place for many years. It became "socially unacceptable," as the range developed into an urban forest. The men and women that depended on the harvest of trees to make a living changed occupations or left the area. Once the forest watch dogs were gone, the forest health was put in control of insects and wildfires. National Parks in Colorado and Wyoming, where no logging is allowed, have provided excellent short term habitat for bark beetles — having killed hundreds of acres of trees. See http://www.vaildaily.com/article/20070122/NEWS/101220048 for more information. While it has been an uphill battle to survive, there are still a relative few licensed timber operators left working in the north state. Many of them refer to themselves as dinosaurs. They help point out forest problems in a timely manner, while the trees are still ripe with value. It will be a sad day in the urban forest when these operators go the way of the dinosaur. There is an economy of scale that is often not reached in salvage-harvesting the urban forest. Having one big dead pine tree removed from your front yard is expensive. Often, the greatest part of the expense is after the tree is on the ground. Clean up and removal of woody material is better than 50-percent of the cost. A landowner may make money with many truck loads of logs, but the ownership structure of the urban forest rarely allows for that. There are a few California Licensed Timber Operators that own self-loading trucks capable of picking up less than a truck load of logs. The parcel owner may save money in yard cleanup by giving the logs away. In doing so, the tree owner can help save a dinosaur; a dinosaur left unprotected by the Environmental Protection Act. To control bark beetle infestation, salvage logging and biomass harvesting maintenance of bark beetle invested forest must be perpetual. BIOMASS CHIPPING — A chipper processes thinned trees and loads a van with burnable biomass that will be converted into electricity. The rising cost of diesel fuel over the last decade has led to inflated cost for hauling the chips to a power house. In order to afford to do this work, chips may be spread-out on the soil. Leonard Hanes rests against the tire of his three wheeled feller-buncher in the photo above left. Skilled operators like Hanes select suppressed, dead, and dying trees first when thinning understory trees. 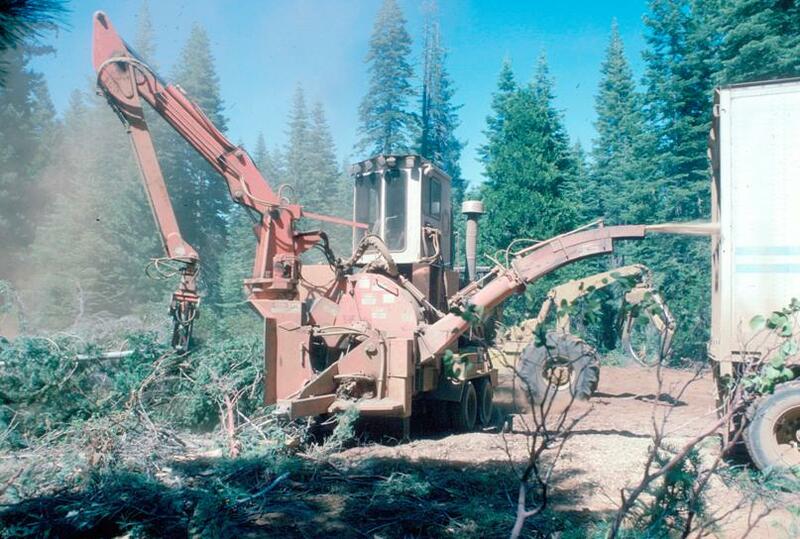 All California operations are supervised by a California Registered Professional Foresters. — unless they are on federal land. No forest requires more intensive management than the urban forest. A worse case scenario is the devastating, sweeping, bark beetle infestation that killed thousands of acres of pine trees in the area of Lake Arrowhead, CA. This blight received intensive scrutiny by the media, in the Fall of 2004, when wildland fires ripped through Southern California. Four years of drought and bark beetle infestation were blamed for the massive die-off. With proactive forest management, the situation would have been avoided. A history of repeated high intensity wildfires does little to deter the development of rural subdivisions and single family dwellings in a path of destruction. The critical climatic conditions for conflagration may occur only two or three days a year. A rare hot, dry, north wind whipped up a firestorm in the Berkeley-Oakland Hills in 1991. One thousand, five hundred eighty acres and 2,700 structures were scorched. Approximately 584 homes burned in a similar Berkeley-Oakland fire in 1923. The 1991 fire was predicted in Author Harold Biswell’s book PRESCRIBED BURNING published in 1989 by the University of California Press. Allowing fuel to grow, die, and increase, may be natural, but so is fire. County building plans often require two escape routes, but rarely do they call for treatment of the powder keg growing in the watershed. Fuel reduction and maintenance will not prevent wildfires, but can lower intensity in critical areas. By reviewing fire history and creating vegetative fuel mosaics designed to break up fuel continuity, fire danger can be decreased. The picture of Lovelady Ridge is to demonstrate the initial phase of brush land conversion resulting in a fuel mosaic. Brush piled by a D-7 CAT on the slope less than 45 percent was burned. The windrows pictured on the lower slope were hand cut and rolled by the Mendocino Hotshots in approximately 12 hours. A buffer strip was left between the cleared area and a Class 1 fish-bearing stream. Intense summer fires historically burn up-slope until 6 p.m., when the wind changes and sends fire burning down draws and canyons at very high rates. Once Lovelady Ridge was converted to grass from brush, firefighters had a safe area from which to backfire. If the timing is right, a backfire can lead to a fire burning itself out as the wind shifts. The newly constructed shaded fuel break on Anderson Ridge was constructed in the 1970s. The purpose of the fuel break was to break up continuity of fuel and allow safer fire suppression access into a watershed. Properly constructed, shaded fuelbreaks can also increase the value growth in the residual stand while providing an economic return for logs sent to the mill. The lack of management induced by so-called "environmental groups," and perpetuated by the US Department of Agriculture has led to the reactionary pumping of millions of tax dollars into the removal of dead and dying trees in the mountains of Southern California. Environmental groups campaigned against salvage logging. Successfully shutting off the supply of logs to hundreds of sawmills and choking communities to death was not enough. Their goal was to stop the harvesting of all trees. Pine bark beetles are endemic to forests. They are a natural part of the environment. They are not evil. They are necessary. Foresters and loggers salvage-harvested trees under beetle attack for better than 80 years in Northern California, and bark beetles still contribute to the ecosystem. Pine bark beetles serve to thin forests. Shaded Fuelbreak — On Collins Almanor Forest foresters used a combination of logging and biomass thinning to create the landscape pictured to the left. Note the form of the remaining trees in the overstory representing fast growing “thrifty” trees. The understory was dense white fir and incense cedar before biomass thinning, that followed logging. The dead standing tree referred to as a “snag” near the center of the picture was retained as wildlife habitat. Canada geese nest in this snag. There are two geese in this picture near the top of the snag. Logging followed by biomass thinning done properly will improve the growth of the remaining trees and fire resistance of the forest. This picture was taken on Highway 89 near Chester.